The evolution of the Vancouver Canucks systems play has been one of the more interesting developments of the last three-plus seasons. In that span, the Canucks have had as many coaches, each with their own unique approach to the game. A case can be made for these changes being most profound in the way each coach approaches the neutral zone. Intuitively, it’s hard to reconcile the importance of the area of play furthest removed from where the goals happen. In reality, controlling the neutral zone goes a long-distance towards securing victory. It’s why I’ve placed a high amount of emphasis on the neutral zone in how I conduct my analysis at the team and individual level. In doing so, I’m tracking every Canucks game this season and as many from other teams as my schedule will accommodate. About a month back, I looked at the Canucks through the neutral zone for the month of October. Today, I’ll bring you the Canucks neutral zone data through the month of November. Now that the sample has increased considerably from my last data set, we’re starting to see percentages normalize in both directions. Henrik Sedin is slowly regressing from having 78% of his entries occur with control of the puck, down to a human level of 65%. On the opposite end of the spectrum, we see players like Alex Burrows and Jake Virtanen making strides towards a breakeven ratio of entries with and without control. One of the more interesting storylines of the season has been that of Sven Baertschi. The Suisse winger has often commented on an increased emphasis on his play away from the puck and defence came at the expense of his offence at the beginning of the season. As Baertschi is becoming increasingly confident as a two-way player, we see him moving away from the peripheries of play and into the thick of it. 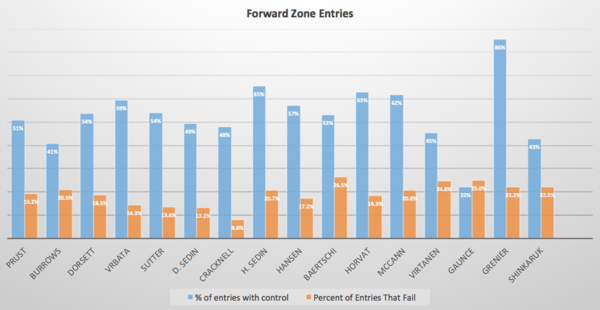 Consequently, his neutral zone impact appears to be decreasing as the season wears on. Then again, if you can break even on neutral zone impact and chip in significant offence, it’s a trade you take eleven days out of ten. Matt Bartkowski has one skill. Granted, it’s a totally useful skill that this lineup could use more of, but you’d rather a more rounded game all the same. Anyways, Bartkowski has the third highest percentage of controlled entries on the entire team. This stat is about as offensively slanted as they come, so that’s pretty damn impressive. Especially given the sample is large enough that it can’t be written off entirely. Didn’t expect Chris Tanev to do much of the heavy lifting in the neutral zone on his pair. Based on these numbers, though, it appears as though the steady defender is doing much of the legwork to get the puck into the oppositions end. As a not-so-self-proclaimed “stats guy” I absolutely love when the data aligns so closely with things that I’m observing. Even better when they match up with the consensus opinion. For example, just look at Bo Horvat. This is a player who’s made his game on bull rushes starting in the neutral zone. Not overly surprising then that Horvat is miles ahead of the pack at generating shots on a per entry basis. Radim Vrbata’s results are encouraging as well, and again, not overly surprising. This is a player who is renowned for his shot volume – sniper monicker be damned. As a player who’s always shooting, it makes sense that Vrbata would generate a high volume of shots per entry. Not so surprisingly, we see Bartkowski near the top of the pack for every metric accounted for. What really caught me off guard was when I looked back at his October data and realized that the Canucks were averaging more than double the amount of shots per Bartkowski zone entry since then. That’s a massive jump. Can only imagine how gaudy the number would be if I isolated the data for November. Tomorrow I’ll be posting the results at the team level. Suffice to say, though, the Canucks are a relatively strong team through the neutral zone. Some of their younger players are playing a key role in driving this success, which speaks to an organizational fludity that values scheme fit when finding players to fit within Willie Desjardins system. Cool stats. I love this stuff. It’s interesting to see how well Bartkowski shows under these metrics. He seems like a player who could really contribute in a specialized role, but with the Canucks’ lack of defensive depth and injury trouble, he’s been forced into roles that don’t mesh well with his skillset. Keep his minutes limited and give him a solid partner and it seems like he’d be a decent player. It makes you wonder how Bartkowski ended up as a defenceman. But then again his great wheels are his main asset. Interesting stats. Wonder if 3 on 3 could be increasing the % for some of these players, as all zones open up quite a bit, making it much easier for a one skill player such as Bartkowski to excel. Could we please have these stats tables sorted top to bottom by at least one column? It looks like the order of the players is totally random, when it would be nice to see them ranked first to worst in whatever column you feel is most impactful to the position. It’s a bit hard to have to jump all over the place to figure the gap from one player to the next. Good work and interesting research, but yes some sorting and borders between columns/rows would make this much easier to interpret. Obviously a tiny, tiny sample size but gaudy numbers from Grenier. Perhaps we should have another look at him at the NHL level. Yeah, Grenier and Gaunce both looked effective enough in the roles we’d ask them to play in their brief appearances. As a sometimes Sbisa apologist, these stats don’t paint a pretty picture. Still, it also looks like Cracknell is a pretty good driver of offense, but not so much…. I’d be really interested to see how other players around the league in similar roles stack up, and for D, is there any similar analysis on escaping your own zone? With our top offensive defenseman being Edler by a mile, he is the only Dman with more than 2 goals and 13 points (he’s at 6 g 20 pts), the D looks to need to be looked at harshly in their own end. I know possession stats drive play for the forwards, but it’s pretty clear Bartkowski et al don’t exactly translate their rushes into direct goals or helpers. It seems to me there’s more angst over stupid turnovers and bad first passes/zone clearances than neutral zone play with our D corps. Im not sure a stat that tells me Bartkowski is our best defenceman is a stat worth tracking.